Sevenoaks summer sale starts Saturday 30th July | What Hi-Fi? Summer, as we all know, can go either way. Either it’s too hot to go outside, and everyone complains that “it’s not the heat, it’s the humidity, and why can’t the ice-cream shop be closer?”, or it’s raining, and everyone complains that “summers just aren’t what they used to be, and why can’t the ice-cream shop be closer?”. Sometimes both of those can happen in the same day. Best bet is to hop in the car and head to your local Sevenoaks Sound and Vision shop. They’re air-conditioned, and they’re full of staff who’ll help take your mind off the Tarmac-melting heat/monsoon/ unseasonable snow and find you some amazing hi-fi and AV kit to try out. For more information – and for more equipment than you could ever fit into your house (although wouldn’t that be lovely?) 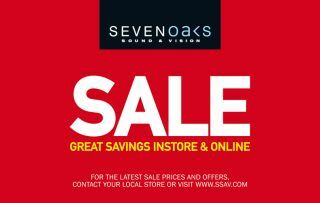 – visit www.sevenoakssoundandvision.co.uk.